Spend the day with this accomplished weaver, learning to craft your very own basket to cart fresh eggs or produce from your kitchen garden. 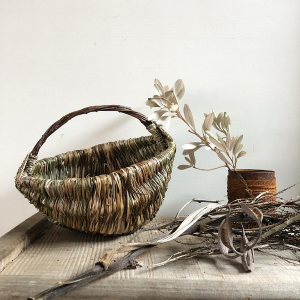 Firstly you will learn to make cord using foraged & prepared plant fibres and these will be used to construct your melon basket. We will then be weaving the body of the basket with all sorts of plant materials. A very hands on day which promises to be a whole lot of fun. All materials included, delicious morning tea, lunch & champagne and hours of weaving & natter. Treat yourself!